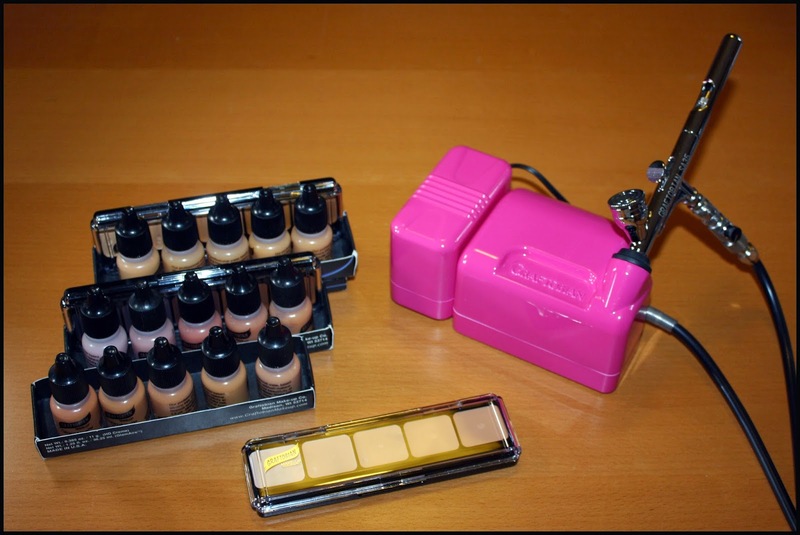 Graftobian is one of three major American companies that have made theatrical, FX and professional beauty makeup available to the public at large. As far as airbrush makeup is concerned, what makes Graftobian unique among its competition is mainly one thing: their Glam Aire line has the widest range of foundation shades of any other makeup company, period. We are talking 58 colours divided in Warm, Neutral and Cool tones, plus six blushes (also divided by undertone) and 6 adjuster colours, totalling a staggering 70 shades. This color system was conceived in collaboration with Hollywood makeup artist Brad Look to be perfectly matched with Graftobian's celebrated High Definition Glamour Cremes, an excellent series of creme foundations that has become an industry standard. This means that not only you are going to find your perfectly matching tone, but you will also be able to integrate a cream product for that same colour, which is something you may want a need to do for a number of reason. For example, the less experienced airbrush user will be able to use the cream colors in areas where airbrushing can be problematic (such and the sensitive under eye area), or for effective spot concealing prior to airbrushing. The color range is so wide that it was used by Mary Erickson and Suzanne Patterson as the base for a multi brand foundation comparison chart in Gretchen Davis' seminal book The Makeup Artist Handbook. The GlamAire range is water based. The formula is very smooth and finely pigmented, with a light texture that is buildable in sheer layers to achieve the desired coverage with a very natural effect. The finish is matte but not overly so, and does not feel nor look at all dry like some water based formulas tend to do, although of course it is always better to moisturize prior to application on naturally drier skin. GlamAire's durability is very good, it does not settle in creases and has a great resistance to transfer. The foundation shades come in 1 oz bottles, but an extensive range of .25 ounce samples can also be purchased if you wish to try it before you commit to larger sizes. Oh, and did I mention it lasts practically forever? A few months ago I accepted a challenge: Two hours to do a complete makeup on ten women (ages ranging from early 20's to late 50's) who had been selected for a historical costume parade. As I was in northern Italy, the women turned out to be all Caucasian of fair to medium complexion. There was zero time for colour matching, but they all turned out beautifully using just three GlamAire shades from the neutral/fair range. After doing ten different faces I thought I had used a lot of product, but then I looked at the bottles and they all still looked totally full! On a more technical note, the product does separate quickly and needs quite a bit of shaking after sitting idle, but I found that if you store the bottles laying flat, the pigment settles on a larger surface and mixing is much faster. The only thing I am not crazy about in regards to this product is the blessed screw caps that tend to make a mess every time you use them, so I hope they will honour my OCD and change them one day. 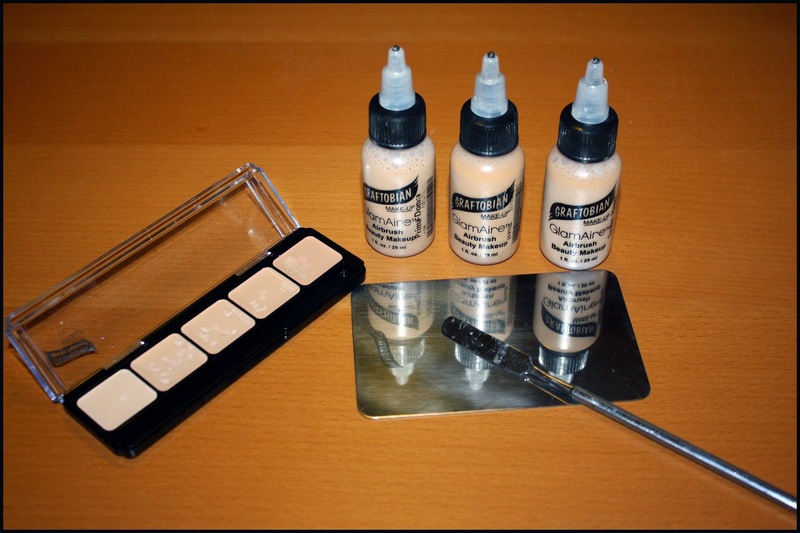 As I was saying in my review for the F/X Aire line, I purchased my HD Glamour Walk-Around™ Kit at Crc Makeup.Com, where the whole Graftobian product range is available. Eric Coffman, Graftobian's owner, shot a very exhaustive video on the contents of the kit, so i will just advise you to watch it here as I could not illustrate it better than he does. I personally enjoy the kit a lot. The design is very compact and it feels even more powerful than its maximum 26 PSI output. The pressure can be adjusted right from the valve via a tiny knob. This takes a little practice if you are not used to it, but some end up preferring this way of controlling the output for its immediate proximity to the hands. The detachable battery works beautifully and the unit performs exactly the same when on battery power. Finally, the airbrush is the very reliable and seemingly ubiquitous S35, an excellent airgun chosen by Graftobian and many a great brand, and that together with the strong pressure output makes the system compatible also with any kind of airbrush makeup available, including silicone based colours. Four different plug adaptors included in the kit will allow you to use it pretty much anywhere in the world. As Eric shows in the video, the HD Glamour package does come with a great lot of makeup, consisting in three sample packs of five shades each with matching creme colour palette (Cool#1 from the lightest of the pink undertone range, Warm#2 from the middle of the yellow undertone range, and Neutral#3 from the darkest of the neutral undertone range). This is a very generous bundle making up an excellent starter kit catering to all ethnicities. The Walk-Around Kit is also available in an F/X Aire package and a Student/Character package with different colour selections. This company I find excellent, they have a wide range of products, broken down by types and sizes, beautiful kit you bought and compliments for having made up so many people in just two hours! non la conoscevo questa società!!! ha molti prodotti!!! grazie per averci fatto conoscere questa società!!! It's a beautiful company! Thanks for the review! 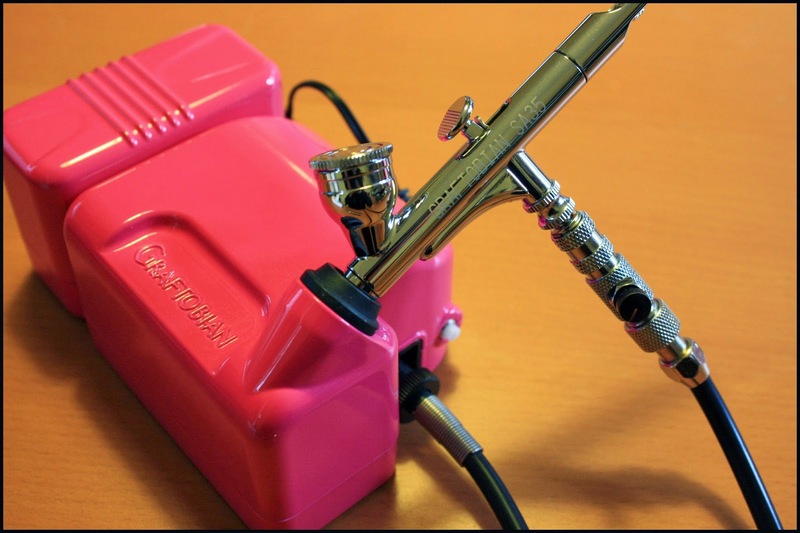 Is the Graftobian compressor compatible with a dual action airbrush, like Iwata, Sparmax, or Kett Transformer airbush. I find that some Airbrush makeup moves on the skin, could you recommend brands that stay put and don't transfer? Seventy Hue ?? A really nothing short of fantastic ! A really nothing short of fantastic !